Duke Nukem Forever is coming on the 6th of May 2011. It’s a momentous occasion that gamers have been waiting twelve years for, so a collector’s edition seems like a no-brainer. The game has just been subjected to hands-on previews in Las Vegas, which has yielded mixed responses. Despite this, many are still foaming at the mouth for the eventual release. 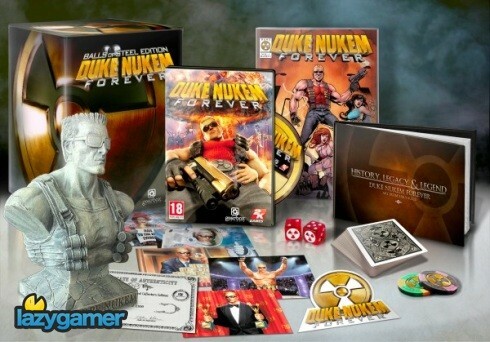 Publisher 2K has announced the â€œBalls of Steel Editionâ€ for Duke Nukem Forever, and despite the fact that it doesn’t come with actual balls of steel, it comes with a ton of other stuff that any Duke fan would buy the hell out of. There’s no price as yet, and no word on whether or not we’ll get this edition here, but considering how we’ve seen previous 2K published collector’s editions in South Africa, there’s no reason why we shouldn’t. So, who is pre-ordering this monster? Next article Soweto Gospel Choir won a Grammy. Why do we care?